Have you ever had a bad dream? Its the worst! You lay your head down on the pillow and fall asleep only to wake up in a cold sweat to find out that you have had a nightmare. Many of you have been writing in to me and asking me about your dreams. I have had emails asking me “why are my loved ones mad and angry in my dreams?” Or asking “ what dreams of death mean?” And many have just been getting nightmare after nightmare that they cant explain. When you lay your head down to sleep your close your eyes and your consciousness opens you up to a new world of thoughts and energy. That is why many times Heaven can use your Dreams as a way to visit you. The spirit world is energy and speaks to you through your thoughts feelings and emotions. Sometimes other messages can get mixed in causing bad dreams and waking up in a panic. Bad dreams are caused by nothing more than your energy field being disrupted by something negative. It could be a person, negative energy, stress or grief can be the reason why your peaceful thoughts can turn into nightmares. Sometimes you don’t realize or connect something in your life with bad dreams until you do some soul searching. You will find that when you heal an internal problem the bad dreams just vanish. Bad dreams act as a ‘road block’ for your loved ones in Heaven being able to reach you. It is like when you turn on the TV and all you see are commercials instead of the main TV show. When you clear our the nightmares it makes for an open path for your loved ones to reach you. Remember Heaven can only reach you when your mind is at a state of peace. 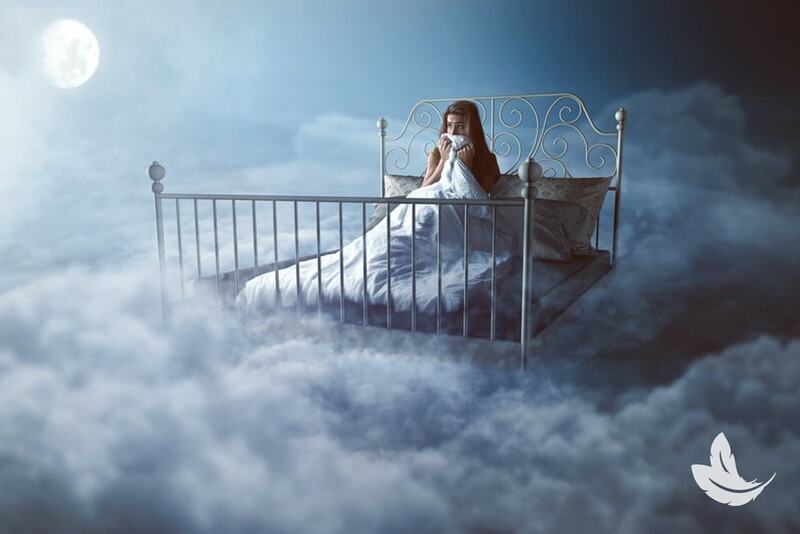 Here are the top 5 causes of bad dreams and ways that you can work to heal them. Recent Death In The Family : When a loved one passes away it can be very hard to let go of the pain and the sadness of losing them. If you don’t release it, it has no where to go and just buries itself deep within you. That is why some people have reoccurring dreams of their loved ones being angry with them from Heaven. It’s not that your loved ones that have died are angry, it’s your subconscious reminding you of the grief you are feeling. It’s important to remind yourself that you did the best you could and that your loved one is in the presence of Angels. Heaven is a place of peace not a place of anger and your loved ones love and support you always not judging you or upset. Resolution: When you feel your mind starting to pull you towards something sad or upsetting about a loved one, redirect your thoughts to thinking about happy times that you enjoyed with them. Your dreams are a direct reflection of that pain you are still holding onto day to day. The more you replace the thoughts associated with grief with happy ones of you and your loved one, the more you begin to release the heaviness and you will notice that the negative dreams clear out. If you had a fight before their passing it can help to visit somewhere special like their grave or somewhere they loved and shave a conversation with them. Tell them your forgive them and love them. They will hear you. Negativity From Other People: Have you ever been around someone that just makes your skin crawl? You may notice that every time you are around them your energy beings to drain and suddenly you don’t feel well or you are just feel plain irritated. We are all connected to one another through energy. When a person is just plain negative that energy can disrupt your overall feeling. Many times the worst part is when it is someone close to you like a friend or an acquaintance. When a person in your life doesn’t want whats best for you, you can literally feel it. Many times people experience this when they are ending a relationship, marriage or friendship. While its hard to cut the cord, holding on can cause you sleepless nights and also bad dreams. Many times its because the person has their negative intention set directly on you. While they are thinking about you you are feeling it. The good news is that nobody can affect your energy unless you let them. Resolution: You can use “Psychic Protection” to clear out the negative thoughts around you. Take a moment before bed to envision outward facing mirrors around your whole body. Negativity can never face itself. By forming outward mirrors, it bounces the negativity back to the source instead of you absorbing it. This especially works great for the people you have to come face to face with and cannot avoid like a coworker. If you are going through a tough time just remember that when you subtract something negative, you allow something more positive to enter. Going To Bed With Racing Thoughts And Worries: It’s the end of the day and the time for you to unwind and put your thoughts, worries and concerns aside. Many times you may notice that when you go to bed worrying about what you are going do the next day you bring those stresses to bed with you. That is why sometimes you may dream of something that you were just thinking about throughout the day. Its important that when you go to bed you focus solely on bringing your mind into a relaxed state of conciseness and wellbeing. Resolution: Keep a pad of paper next to your bed and write down all the things that you are stressing over. Ask Heaven and your Angels to create a divine plan for you while you sleep. When you write things down you allow them to transfer from your thoughts down to paper. It is a natural release without you knowing it. By releasing the stress on paper, you allow more room for divine thoughts while you sleep. Your Fears Need To Be Put Aside: I once had a client who was so nervous that his wife would cheat on him while he was on business trips that we would dream about it at night! It may seem funny while reading this but to some people it is very real. Your biggest fears sometimes will present themselves in your Dreams. I remember this man came to me for a reading and I was told by his mother that had passed away that their was nothing for him to worry about. He and his wife had a deep love and bond. This just goes to show that you cannot let your fears control your day to day life or make invade your sleep. When your fears get buried deep within you they emerge in a dream and can literally come back and haunt you. Lucky Heaven and your Angels can help with this. Resolution: Right before you sleep ask Heaven and your Angels to help you by alleviating the stress and worries from your life. As you close your eyes and lay of the pillow envision a team of Angels flying toward you with big empty baskets. As they fly in close place your stress and worry in each basket and watch as each Angel flies away and takes it back to Heaven. There are some things in life you just need to leave in Heavens hands to fix. This will allow your fears to be healed by your Angels. They will watch over everything from now on. A Warning From Heaven: This is rare but if your loved ones urgently need to warn you about a situation, you may dream a premonition if it before it happens. Usually this is not a scary experience like a nightmare but more like a strong nudging from Heaven that brings you attention to a situation, person or matter. The best way to know if your dream is “wishful thinking” or in actuality a message is if it keeps on repeating itself over and over again. If you keep having the same dream with a warning message you may notice that other family member are having the same dream. Heaven usually tried to reach multiple family members to warn them not just one. Resolution: Share your dream with your friends and family members or those who are in it. They many tell you that they have been getting the same exact dream. Also, ask Heaven and your Angels for more guidance ask them what you need to know and what they are warning you about. Heaven will only send you a warning if there is a way that you can fix it or prevent something from happening. Keep an eye out for the next message they send to you. The End All Resolution: Your loved ones in Heaven want the best for you. Many times the things that cannot be healed by the end of the day need to be left in Heavens hands to be taken care of while you sleep. Don’t bring your worries to bed with you. Allow Heaven and your Angels to take care of the worried while you sleep and clear out your thoughts. Here is a prayer that you can say at night. I personally say this before I go to bed and have no bad dreams. All of my guides and all of my Angels. Please watch over my family and I as I sleep tonight. Please take away all of the worrisome thoughts and the stressful thoughts while I am fast asleep. Please keep me protected from all negative energy and bad dreams and thank you for the healing and protection that has already been given.